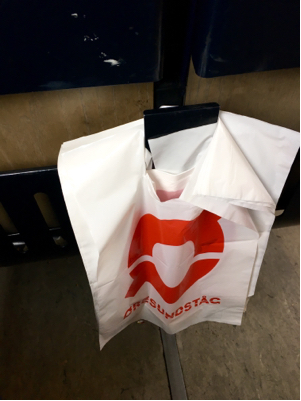 While travelling on the local Copenhagen train system, I was curious to find plastic bags at the back of each seat. Why are these kept there / what purpose are they supposed to be used for? Firstly, that's not a local train - it's the international train that links Denmark and Sweden. To answer your question: I asked about this when I was travelling on the Øresundståg a couple of years ago as I wanted somewhere to put trash. The train manager told me I can use it for "whatever I want" and that the bags are there as a convenience for customers and to help reduce the amount of trash left openly on the train. Not the answer you're looking for? Browse other questions tagged trains copenhagen or ask your own question.